After two days at the SFO Marriott, the 5th World Open Innovation Conference is now in the books. The experiment we started four years ago now is well established as a permanent fixture. I would love to talk about what I saw, but in the first four sessions (plus the poster session) my assignment was fixed by presenting 1 paper, 1 poster, watching a co-author present a paper, a session discussant and a participant in one of the industry challenges. Of the keynotes, I thought Scott Stern’s presentation on his forthcoming Entrepreneurial Strategy textbook was dynamite. It will change how I teach entrepreneurship, and likely how I research and practice it as well. Melissa Schilling’s presentation on platform ecosystems was thought-provoking at times, but not as novel since we have had a large overlap of research interests for the past 20 years. The John Chambers keynote was really impressive — I've never heard him speak before, and us mere mortals don’t go around telling heads of state of the leading Western democracies what they should be doing about promoting entrepreneurship and job growth. As with OUI, even on the Left Coast WOIC now has a very European flavor to it. It’s always good to have American academics, but the bread and butter of the global innovation studies invisible community are the Europeans. I guess without Herr Doktor von Hippel as the guest of honor, it has a less Germanic feel, but still — particularly compared to the first two WOIC — the European audience is a core (if not the core constituency). (I was program chair the first two years, and I remember at least one year worrying about the attrition of Europeans who were accepted and then cancelled at the last minute). This was the second time I presented a poster at WOIC. 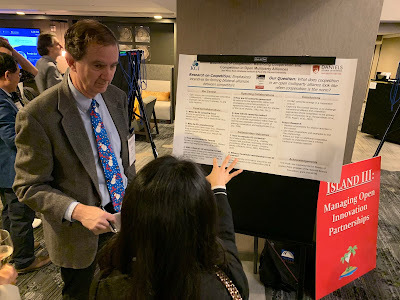 As before, I felt the feedback was better in the poster format than in the paper presentations, and lament the decision of many conference (including AOM) to discontinue this format. Of course it helps that (as in the initial year) the posters are held during cocktail hour and everyone is in a good mood. A shout out to all my old (and new) OI friends. Safe travels home, Merry Christmas and a Happy New Year. OUI! Wir sind in New York! Today was the first day of #OUI2018 here at New York University, making its first appearance in the Big Apple. The 16th Open and User Innovation Conference is hosted by Hila Lifshitz-Assaf and Natalia Levina of the NYU Stern School of Business and Kathy Strandburg of (as yet unnamed) law school, the conference is another great success for the von Hippel crowd. As with other OUI conferences, the most popular languages for participants are English and German. OUI is one of my favorite conference and the only one I have consistently attended in my academic career. This will be my 9th OUI (of 11 conferences) since I attended my first OUI in 2008. It will also be my most active OUI of the nine, with four papers (presenting one and a fraction) between Tuesday morning and the end of the conference at lunchtime Wednesday. It’s great that the various mentions of crowdsourcing (and other forms of open innovation) are continuing the cross-pollination between the UI and OI camps. I look forward to the remaining sessions and keynote speakers. The potential economic impacts of 3D printing (or “additive manufacturing”) have attracted considerable attention in recent years. For example, in 2011 the publisher of Forbes predicted that 3D printing would become the “transformative technology of the 2015–2025 period” (Karlgraad, 2011). Likewise, the editor of Wired forecasted that the “desktop manufacturing revolution [would] change the world as much as the personal computer did” (Anderson, 2012). 3D printing is also acknowledged as a key component of the digitalization of manufacturing, sometimes also called Industry 4.0. In the past decade, business researchers have highlighted the transformative effects of such digital fabrication technologies. For example, Ford and Despeisse (2016) concluded that 3D printing has the potential to enable sustainable manufacturing, hereby promoting the shift towards a circular economy (Despeisse et al., 2017) and reaching global sustainability (Gebler et al., 2014). Additive manufacturing creates new rules of competition including “economies of one” (Petrick and Simpson, 2013) and accelerating mass customisation (Jiang et al., 2017). Researchers have also examined how existing management and other theories are affected by 3D printing. Additive manufacturing technologies have the potential to reconfigure business models (Rayna and Striukova, 2016), supply chains (Bogers et al., 2016), and market structure (Weller et al., 2015). On-demand digital fabrication makes it possible to collaborate online to produce tangible objects (West and Kuk, 2016) and promote open and user innovation (Rayna et al., 2015). At the same time, the end goal of producing hardware and other physical objects changes the nature both of online collaboration (Raasch et al., 2009) and entrepreneurship enabled by online communities (Greul et al., 2017). Thus, despite the potentially broad impacts of 3D printing and this emerging body of research, many important questions remain (Ford et al., 2016). In particular, three decades since the first 3D printers were sold, most of the business successes have been in low-volume niche markets. More compelling applications and use cases are needed if 3D printing is to cross the chasm, grow and become a mainstream technology (Moore, 2005). This workshop will continue the trajectory begun four years earlier at the 2014 “The Business and Economic Impact of 3D Printing” workshop hosted by RTWH Aachen. We welcome a wide range of empirical and theoretical research related to the business and economic aspects of digital fabrication. Papers and presentations should be oriented towards a general innovation and technology management audience (as might be found at AOM, DRUID, or EURAM), and not at experts in 3D printing technologies. Early stage research is encouraged. Abstracts must be submitted by 31 Jan 2018. For formatting requirements or to submit a paper, see the submission page.